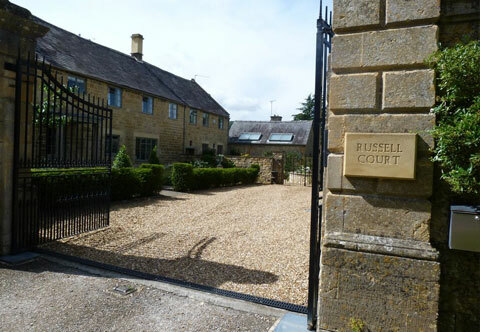 Russell Court Cottage is a beautifully modernised 18th century home, part of the original stables of historic Russell House. Russell Court Cottage is a beautifully modernised 18th century home, part of the original stables of historic Russell House (Grade 2 starred), which housed the Broadway Colony of artists and writers in the 1880s. Among them were Henry James, and John Singer Sargent, whose "Carnation, Lily, Lily, Rose" was painted in the gardens, currently under restoration by the owners. Russell Court Cottage has three double bedrooms, all en-suite with high quality Villeroy & Boch fittings and Matki showers. A fourth bedroom with Californian king-size bed, en-suite with walk-in shower can also be made available for parties that want more bedroom space (please enquire for pricing). The cottage is set in its own private garden with fishpond and fountain with arbour, table and chairs for outside dining. It has its own driveway with electric gates, and parking for up to four cars. Access is also available to the gardens of historic Russell House, with its Gothic follies, underground ice-house, and mature trees.